It’s February 20, and Valentine’s Day is finally, mercifully over. It began last Monday, February 10, when I had Noah begin making cards for the grandparents and his cousin Finn. Even though all that was required of him was spelling out names and gluing on some paper hearts and stickers of his choice, I knew that we were going to need a full two days to make the four cards. Art is not Noah’s thing. At least, it’s not something he likes to do with me. But I know the relatives appreciate handmade cards, and it gives us a chance to talk about who we’re sending the cards to and why. Not to mention it gives him a little practice with writing, which never hurts. But this type of project always does seem to hurt. A lot. Take yesterday for example. 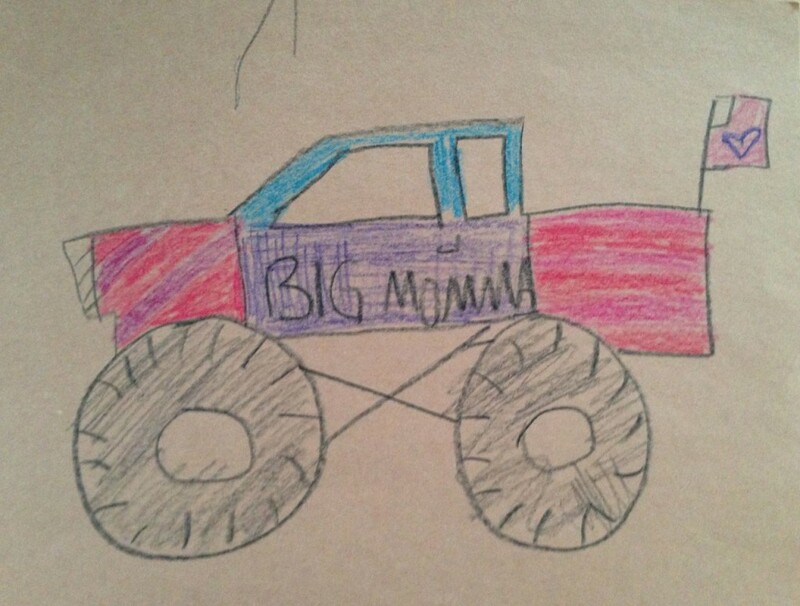 We were reading a book on Monster Trucks, and, feeling like the funnest mother ever, I suggested we draw our own monster trucks. He loved the idea, but, when it came down to it, he wanted me to do the work. Fine. I drew something that resembled a truck. “What do you want to call it?” I asked him. “I don’t know. You pick.” After giving him several more chances to name the truck, I wrote a name on it. Noah immediately hated it. He threw himself down on the floor, wailing and kicking. We should have just quit then. But he was begging for another truck. So I drew one. A bigger one. He decided to name it Hot Sauce, which I thought was awesome, and told him so. He asked me how to spell it. We got as far as “s” when a new meltdown began. He didn’t like the way he wrote the “s.” I told him it looked fine, and it really did. I told him to just move on to the “a.” He did, but something went wrong with that letter, too. He and Hot Sauce fell to the ground. More wailing and kicking. He suddenly stopped, “How did this water get all over my truck?” he asked. “Those are your tears, Noah,” I told him. This only renewed his hysteria. But back to last week. We eventually got the Valentine’s cards done, and Wednesday morning I got them to the post office right before the snow arrived. 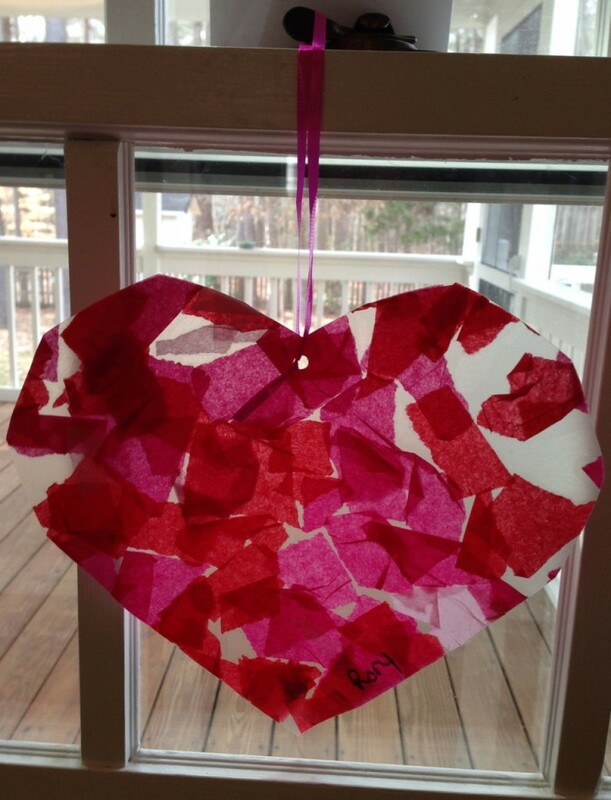 But as I was rushing out the door to get both kids to school so I could get my Snowpacolypse errands run before their early dismissal, I remembered that Rory’s class – which only meets on Mondays and Wednesdays – was having their Valentine’s party that day. 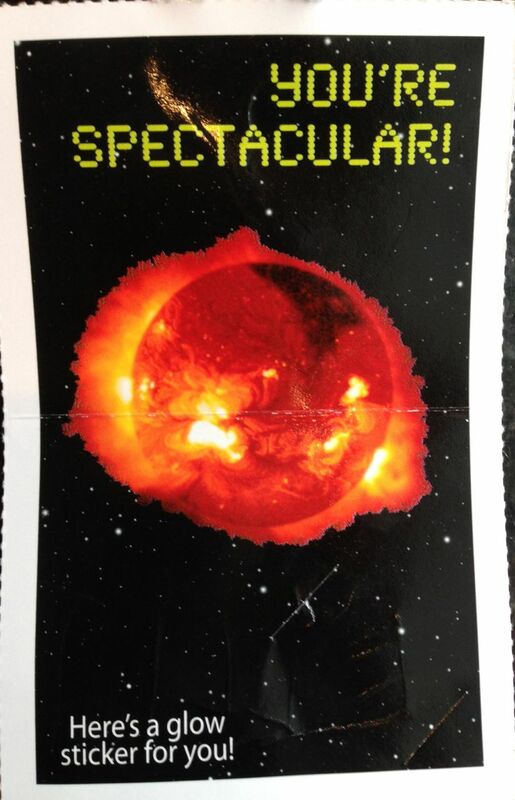 I grabbed some extra cards from the box I had purchased for Noah and hastily addressed them. Only as I was handing them to Rory’s teacher did I realize that I hadn’t even folded and sealed the with the enclosed heart stickers. Not to mention the cards were pretty much the cheapest ones available at Target. I didn’t select them for that reason; I picked the space-themed cards because Noah has been interested in the planets lately. But they were pretty basic. I didn’t think much about it until Rory came home with his bag of valentines. As I sat at the kitchen table going through the bag with him, a touch of shame began to warm my cheeks. There were a couple cheap-o cards like mine, but several parents had made homemade cards with glitter and puffy hearts. I chalked it up to arts-and-crafts not being my thing. I figured that I got cards to school for exchange, and that was all I needed to do. The Great Snow of ’14 arrived that afternoon, meaning school was cancelled for the rest of the week, and along with it, Noah’s Valentine’s Day party. We had a nice celebration at home. I had bought some heart-shaped plates and coordinating placemats at Target and had sprinkled some cut-out paper hearts on the table. I felt like I had just recreated the cover of a special Valentine’s Day issue of Martha Stewart Living. “That was the party,” I said. We managed to have a good long weekend, but I think everyone was happy when Pat dropped Noah off at school Tuesday morning. Until about twenty minutes after they left, when Pat called me. If this were Rory, I probably would have crossed my fingers that the party was another day and just continued on with my morning. But all I could think about was Noah’s sad face as all the other kids put cards into each other’s bags. It’s one thing to have cheap-o cards. It’s another thing to have NO cards. I grabbed the box, put Rory in front of Dinosaur Train, and started writing. There are 18 kids in Noah’s class, plus four teachers. I inserted the “glow sticker” into each card and, lesson learned, folded and sealed them. I hustled Rory into the car and we drove to school. The front door of the school was already locked. I banged on it until the director, who used to be Noah’s teacher, let us in. We went into Noah’s class, where the younger girls swarmed Rory, hugging and petting him. “I have Noah’s valentines,” I panted, handing one of Noah’s teachers the tacky, nearly weightless plastic T.J. Maxx bag containing the 20-some folded cards. Thanks, Pat. Well, at least I could say I was early. For once in my life. This afternoon we sat at the kitchen table going through his bag of cards. Even though I’m over my “not crafty” shame, I was a tiny bit relieved that it was an even mix of homemade and inexpensive folded cards, including one planet card. “Hey, that’s like ours,” Noah said. “Yeah, now you get a glow sticker,” I said. Noah examined the words on the card. “Mom, that spelling is like in space.” I could see his mind working to explain this. “You know, like on a screen.” He was right. The font was straight from an old-school computer. I guess everyone is creative in his or her own way. 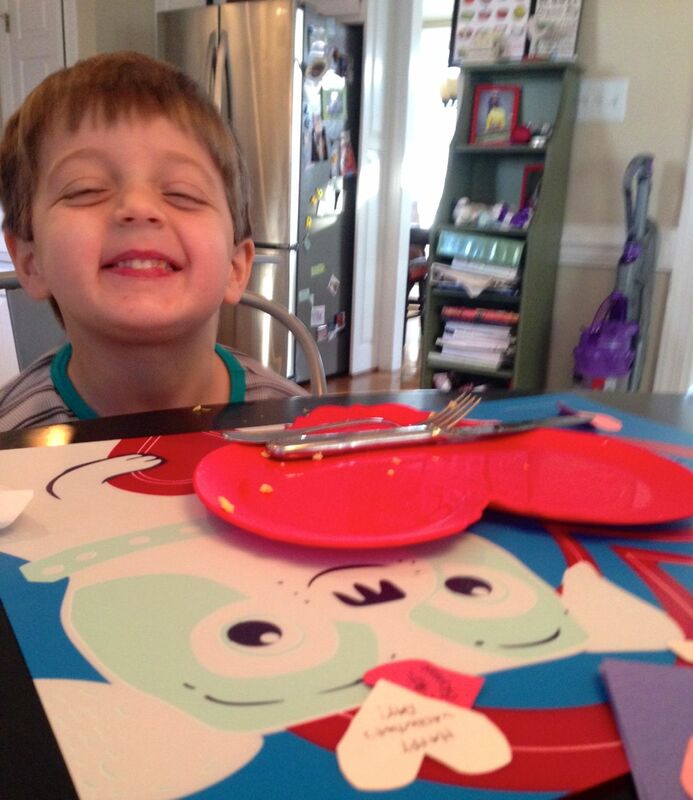 Noah doesn’t need Hot Sauce – or a stack of homemade Valentine’s cards – to prove that. Do you encourage your kids to do activities they’re less interested in, or just let them focus on what they like? If so, how do you do it without making them feel pressured? Finally, what would your monster truck name be?